In 1965 when this shot was taken there was only two rear engined double deck vehicles the Daimler Fleetline and the Leyland Atlantean. The Fleetline had one big advantage over the early Atlanteans in that it had a flat central gangway downstairs and the step up from the ground to entrance floor level was only 1 foot. The advantage of the easy access and high seating capacity meant that the Fleetline became a very popular vehicle with municipal and company operators alike. The first Fleetlines had the Daimler CD6 8.6 litre six cylinder engine but has soon as it went into serious production it was supplied with the Gardner 6LX 10.45 litre engine as standard with an option of the Gardner 6LW 8.4 litre both were six cylinder diesels. The gearbox was of the four speed Daimatic direct selection epicyclic type and the braking system was air pressure. As with all Daimler vehicles the coding is fairly straight forward the ‘R’ stands for rear engine and the ‘G’ stands for the Gardner engine, I wish I knew what the ‘C’ stood for as it precedes most Daimler codes ‘CWG’ and ‘CVG’ for example my guess is ‘Chassis’ but if anybody knows better or has a good idea please please leave a comment. The ‘C’ chassis prefix did stand for Commercial vehicle, as Daimler also made private cars. 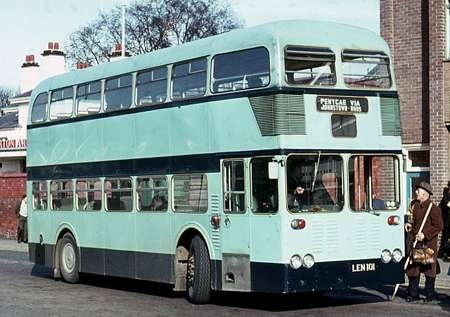 Sadly this tradition ended when Leyland in its infinite wisdom moved Daimler bus production to Leyland. 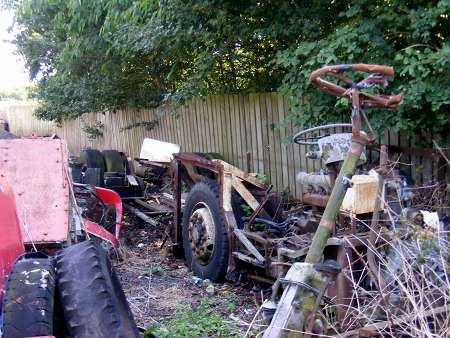 These chassis were designated ‘FE’, in line with Leyland’s then practice of using the first and last letters of model names as chassis designations (eg: ON OlympiaN; TN TitaN; NL NationaL; LX LynX). The debate goes on about how successful the RMF would have been had it gone into full scale production, but at Northern’s Percy Main depot we had both Atlanteans and Fleetlines, and for my money the Fleetline was a far superior vehicle, ‘perhaps that’s why it was killed off when Daimler became part of British Leyland’ All ours had the Gardner 6LW, the earlier ones were MCW bodied but my favourites were the later Alexander bodied vehicles, most of them were transferred to East Yorkshire when NBC came about. This style of East Lancs body for rear engined double deckers only appeared on this batch for Bury and an almost contemporaneous batch of Fleetlines for Coventry. 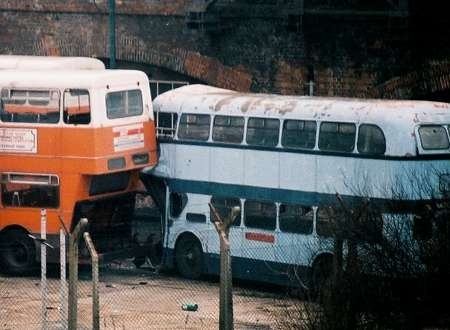 …..and three batches of PDR1/2s for Sheffield with Neepsend bodies…..
Phil, Warrington also had Fleetlines with this style of East Lancs bodywork Atlanteans to the same design but built in Sheffield by Neepsend were bought by the corporation. Both the Fleetlines and Atlanteans dated from 1965-1966. An example of the Warrington Fleetlines appears at this link. You are right about the Neepsend bodies for Sheffield and Warrington. I managed to eliminate part of my script after typing in the link to the Coventry photo and didn’t notice until I just read your replies. 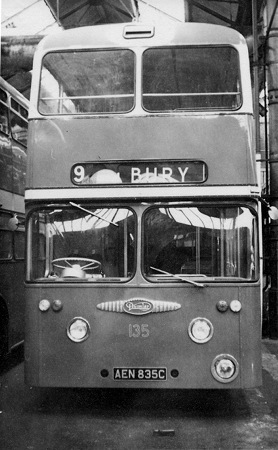 "The photo shows Coventry 22 – but though the design is the same (in all but detail) the body is by Neepsend and is one of a batch where East Lancs produced 9 and Neepsend 13 and Coventry split delivery of chassis in a staggered way between the two plants (see Peter Gould’s list for Coventry 1966). Sheffield received vehicles of this design from Neepsend as well and, strangely, Warrington also received Neepsend produced vehicles. Is this a case of congestion at East Lancs or was this really designed to be built in Sheffield?" Can somebody clarify the relationship between East Lancs and Neepsend. Did East Lancs buy Neepsend to gain additional capacity? if so it seems to have been a bit of waste of time as – to my recollection – Neepsend didn’t last all that long as a body builder . . . which raises the question, what became of them? And what were Neepsend doing before they started assembling East Lancs bodies? – would general metalwork fabrication be a good guess? The entire share capital of East Lancashire Coachbuilders Ltd was bought by Cravens Railway Carriage and Wagon Company Ltd of Sheffield in 1964. Cravens itself was a subsidiary of the John Brown group of Clydebank, though the founder, John Brown, was himself born in Sheffield in 1816. Although it had made tentative forays into the bus building business between the wars, Cravens was by then primarily a constructor of railway rolling stock. Because the East Lancs premises in Blackburn were of constricted size, Cravens set up a subsidiary in the Neepsend area of Sheffield to increase the productive capacity of the bus bodybuilding side of the business. Neepsend built bodies to East Lancs designs from 1964 before closing completely in 1968. There is a deal of confusion on a great number of sites regarding just who were Neepsend and what they did. It seems that the long established Sheffield firm of Cravens, which over the years produced trams, railway carriages and bus bodies bought East Lancs around 1960. They set up Neepsend on Penistone Rd, away from their main site, at about the same time initially, as I understand it, as an overflow site (some local forums say that some BRS "Noddy" vans were built there but these were all supposed to have been built by Star Bodies, the BRS in house builder). There are reports on some local Sheffield forums regarding a building collapse at the property damaging some vans in production. At the time both East Lancs and the former Craven plant in Sheffield were owned by John Brown engineering The company decided to use the Sheffield capacity to build bodies to East Lancs design. In 1964 the John Brown Engineering Group bought out the road vehicle body building part of Cravens – the railway part went to Metro-Cammell – and recommenced bus building in Sheffield at Neepsend as an overflow to their newly acquired East Lancs operation. I was a regular visitor on business to the Blackburn operation up to and beyond the fire. The whole place was cramped and would have horrified a modern health and safety inspector. If my memory is right there was an extension completed well before the fire which probably meant the demise of Neepsend, though the clutter remained. 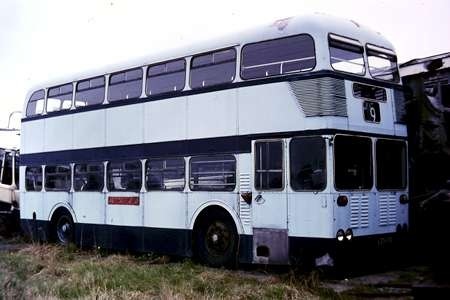 Further to my last comment Cravens actually bought a stake in East Lancs rather than the other way round in an effort to get back into bus building. This was achieved by a purchase of shares from the bank which was acting as executor of the will of one of the company founders. However the size of the factory and poor quality killed the project off by 1968. I have a hazy memory that the Neepsend factory was purpose built, because it had partly "glazed" doors on to Penistone Road through which the skeletons of buses could be seen. It always seemed a bit of a mystery why this was there, then.